As soon as we arrived in Mousehole (pronounced Maw-zole) we instantly new why it was called "Mousehole". The streets were only big enough to fit one car down (and even that was stretch sometimes) and on numerous occasions - specifically a couple of memorable encounters that immediately spring to mind (that both happened on the same patch of road) - where we met an oncoming car and we struggled (as did the other car) to manoeuvre around each other so we were just millimetres from the side of the houses that lined the road. A lot of reversing was involved, as was a (sort of) stare-down where us and the other car would just stare at each other - both drivers getting to the point where neither of them new where they could move next in order to let the other one through. On one occasion we got the point where we just had to pull into another tiny road (where lots of pedestrians walk) just to let the other cars through - this was particularly stressful as it meant none of the pedestrians could get through whilst we were stuck where we were - meaning we had a crowd of people in front of our car and a huge line of cars driving through behind the car and we were the centre piece to it all (insert rolling eyes emoji). We did eventually get back to the house we were staying in, but it's safe to say that wasn't the last road encounter we had (but it was definitely the worst). All the other occasions meant our quite large car had to get through quite tight spaces - and every single encounter was a very "hold your breath, don't panic and shut up" situation - the amount of times my mum said "Just let your dad concentrate" was countless. Saying that though - my dad did an amazing job - he handled each encounter very well and although sometimes it took him a few minutes, he always managed to figure out exactly where to manoeuvre or how to squeeze through a really small gap. We also got quite confused with the twisting and turning roads when we first arrived - but after a few days driving down the same lanes, I got to grips with our daily route and could easily direct my dad through the main town. Although the roads could be a bit overwhelming at times - Mousehole is undoubtedly one of the most beautiful places I've ever visited. We stayed right by the sea, with our garden wall being the sea wall and all we had to do was look out to see the sea or look down and see the waves crashing up against the stoney beach. You had to go through a gate to access our property and you instantly came to a stony path - our house was on the right of the path and our garden was on the left - so all you had to do was cross this little path and you were literally right by the sea it was incredible. Our access to the beach was also amazingly close. You went out of the gate and instantly turned right and there were some (admittedly) uneven steps that took you straight down to the rocky beach. My mum was always stood at our garden wall watching me, my sister and dad down on the beach. The harbour had a little beach area, which was surrounded with all the little village shops, galleries and cafe's, and was only a 2/3 minute walk along the seafront away from our property, which was perfectly ideal, for our evening walks and breakfasts out in the morning. Our evening walks around the town allowed us to explore all the little houses and cottages which were hidden in all the nooks and crannies of the village. The village was a maze of sorts, perfect for the whole "the cat catching the mouse" thing - so all the streets seemed to interlink, with them twisting and turning every time you walked a few metres, it was very easy to just wander aimlessly through the village and eventually end up somewhere we recognised. The harbour was also lined with colourful lights, which were beautifully placed, so when it got dark they reflected off of the calm water. We could see the lights from our garden, however that was from a distance, so seeing them close up every evening was so incredible. Waking up, and going to bed listening to the sea, and seeing the evening lights, are definitely what I miss most about Mousehole. We had a completely jam packed holiday, seeing "The Man Engine" in St. Just and visiting Cape Cornwall on our first day (6th August) , we also dropped into a charity craft fair at one of the local schools - it doesn't sound much but it was one of the best craft fairs we'd been to in a long time. There were at least a couple of hundred stalls, placed in various places around the senior school and they were selling a complete range of things like light pulls and notepads to locally made hanging decorations, and jewellery - I managed to find a beautiful necklace that I absolutely adore and is one of my favourite purchases from my holiday. 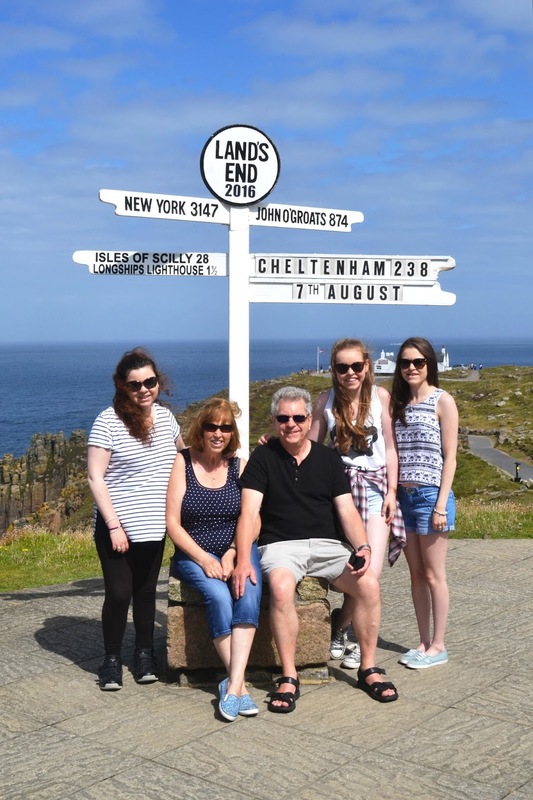 On the second day (7th August), we went to Lands End, which was somewhere I was really keen to go. My Grampy and Gran went there back in 1976 and my parents had visited there previously too, so it made me really excited to visit the most Southern end of the UK. 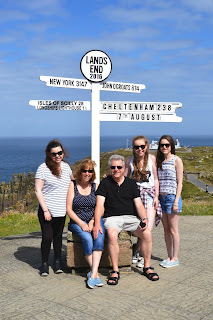 The first thing we did was have our picture taken by the iconic Lands End sign - which was the main reason we were visiting there anyway and the thing we were all really keen to do. We then went to read the Lands End Story; which was really interesting as we got to read about the people who had walked from Lands End to John o'Grotes (or vice versa) and how long the journey takes in various forms of travel. We weren't really interested in doing any of the paid activites such as the 4D cinema and Arthur's quest - they were mainly aimed at children anyway - but we decided to walk down to see the craft sheds, however we were quite disappointed with the two small shops that we discovered, luckily the views from where we were, were incredible, so they really made up for the disappointment, and walking back along the cliff edge with my dad really gave us spectacular views. We then went and visited Sennen Cove - whilst we're staying near the sea we always try to visit a range of beaches whenever we can so going for our first paddle of the holiday at Sennen Cove was a really nice way of spending our afternoon and evening. The third day (8th August) was when my dad woke me up at 6am to see the sunrise, it was absolutely incredible, and I was so determined to see the sun come up from behind the sea before we left Mousehole so to actually have the opportunity to see an orange and yellow sunrise, made me so happy (I then went back to bed). We then visited the Seal Sanctuary and although it was really cute to see the rescue seals, it wasn't worth the £15 we would've paid if we hadn't of had vouchers. It was a lovely day out, the sanctuary just didn't actually have that many seals as lot's of them had been re-released back into the wild. We then went to Poldhu beach, however we didn't stay for very long as the waves were quite rough so there were lots of surfers about, and the sun had (typically) disappeared on us; but I love visiting new beaches and paddling in the sea so even though we were only there for a short amount of time I was overjoyed. After leaving Poldhu we drove back up the road to Mullion Meadows craft centre. We'd past it on our way to the beach and spotted the Trenance Chocolate Factory so new we needed to make a stop to look around. Although the other craft shops were cute, the highlight of the centre was definitely the chocolate shop, me and my sisters spent quite a while in there looking around and choosing our chocolate (it sounds sad but trust me - this chocolate was lush). 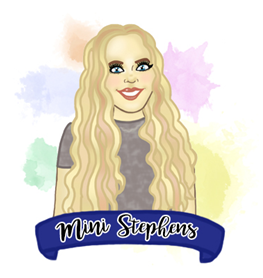 On the fourth day (9th August), we had booked tickets to the Minack Theatre to see the Hertfordshire Players perform Nicholas Nickleby Part 1 by Charles Dickens. As we were seeing an afternoon showing of the play, we went for breakfast at a local cafe, 'Hole Foods Deli and Cafe - which was absolutely delicious, before setting off to Porthcurno. The play was absolutely incredible, we'd heard nothing but good things about this outdoor theatre, and it totally lived up to all expectations. We had super sunny weather and the view of the sea behind the stage was beautiful, we'd never seen a show anything like it, so it was a really great thing to experience and if you ever get the chance to - I couldn't recommend enough that you visit the Minack theatre. My drama teacher had mentioned it to us many times throughout my time in his class, it's one of the most famous outdoor theatres in the UK, so to finally experience a show at one the many theatres he had mentioned, was so exciting. The fifth day (10th August), was a day of relaxing and exploring the village, we went to some of the galleries and shops in the town (that we'd previously snooped at through the windows), and then we got a takeaway lunch from the 'Hole foods cafe and travelled to Lynfield Craft Centre in Perranuthnoe (as you can tell we're a very crafty family) which was only small, but it had a lot of variety, and loads of different items on sale. It was lovely to spend a day which was really relaxed and chilled where we didn't have to rush around to do anything or have any set in stone plans. On our final day in Moushole we visited St. Michaels Mount. We took the boat across from Marazion and me, dad and my sister, Katie, bought tickets to walk up to the castle, whilst my mum and my other sister, Emma waited on the ground and browsed the few shops that were there. The views from the castle and the terraces were absolutely stunning, it was definitely worth the steep walk up to the top. It was also quite interesting to read about the history of the building and the family that live there now. A nice personal touch was that the visitors leaflet was written in 1st person, from the point of view of one of the family members that currently live in the house, he spoke about his experiences and memories of different rooms and artefacts, from when he was a child and from present time, and it made reading through the leaflet a lot more interesting than it would've been if it was a generic visitors guide. After coming down from the Mount we met up with the other Stephens' clan and went for lunch in the Michael's Mount restaurant before browsing the shops and waiting for the Causeway to open up so we could walk along the cobbled path to return to the mainland. After packing up the car, browsing a few more shops, and visiting 'Hole Foods one last time for Coffee and Cake, we left Mousehole was sad, but fond smiles on our faces. On our way home we stopped off at The Eden Project, where there are two biomes. These hold plants that are collected from a diverse range of climates and environments. We visited the Rainforest Biome first, the bigger of the two biomes and definitely the hotter one, at some points whilst walking through I thought I'd have to leave due to overheating, but I'm so glad it didn't come to that. It was incredible to see the different plants that we'd never normally be able to see in the UK due to our climate. and witness/understand how some of the unusual plants grow and develop. There were some incredibly beautiful plants, and some more unattractive ones too - but nevertheless they were all interesting to see. The only thing we were disappointed in was that me and my dad weren't able to do the canopy walk up in the tree tops. Although I was incredibly warm by this point it was still something I wanted to experience, unfortunately the temperature was rising and it got so high it was unsafe for anyone to be going up to the top of the Biome. This all happened as we got to the back of the line - and as the line was quite long, we didn't want to risk being the ones that couldn't cope with the humid temperature that was constantly rising. I felt worse for my dad - although I would've liked to do it, I had got so warm that I wasn't overly heartbroken that we weren't allowed to - but I could tell it was something he would've really liked to do and although he's good at brushing off that sort of thing, I felt really bad for him that we were so close to doing it but just missed the opportunity. Anyway, after leaving the Rainforest Biome we stopped for a toilet and ice cream break in order to cool down, and then we entered the Mediterranean Biome, which was a lot cooler than the previous biome but I also didn't find it as interesting - although there were still some really cool and different plants and sculptures in the biome, to me, it didn't have the "wow" factor that the rainforest biome had given me. Overall, I had an incredible holiday. Cornwall is such a beautiful place and I can see why it's such a huge tourist attraction each year. I would return in the bat of an eye-lid if I could. If you're ever looking for somewhere to holiday, Mousehole is amazing - although it's a tiny village and can get busy in the day - it doesn't matter as the experience of staying there is still incredible and the quiet evenings are so peaceful, it's amazing. "It's the memories you make and the people you're with that make the holiday special - the destination is just a plus"